If I told you the Capital Grille was a posh, wood-paneled restaurant filled with mounted animal heads, private wine lockers, and gilt-framed portraits, that would be only half the story. The manly clubhouse decor is the uniform of expense-account steak-house chains. And though handsomely designed — the large space is carved into five dining rooms, creating a sense of warmth and intimacy — the restaurant looks like a dozen others I can think of. Even the menu is pure steak-house widget, from the shrimp cocktail and the hearts of palm salad to the creamed spinach side dish and the cheesecake for dessert. No, this Providence, R.I.-based chain is not about reinventing the chophouse. 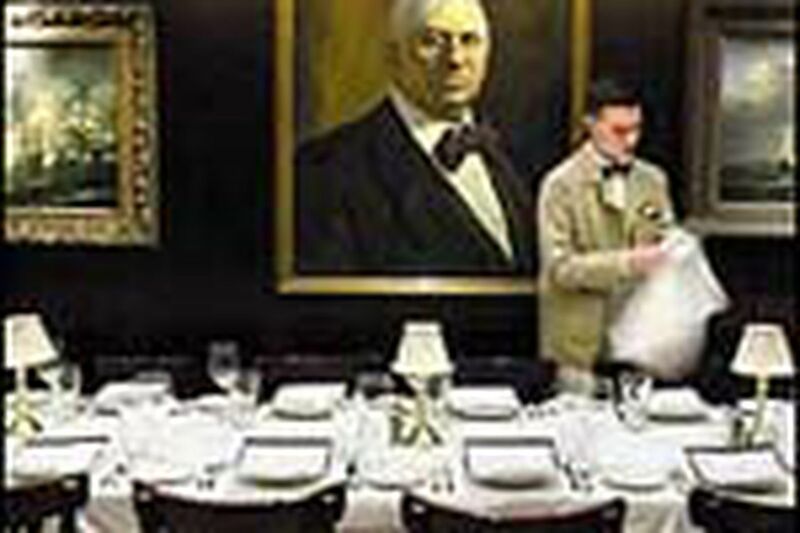 But its success in refining the concept makes the Capital Grille stand out in a city with a broilerful of red-meat competitors. Almost everything is right. The dry-aged steaks are succulent and consistently cooked to perfect doneness — which, believe me, is a major challenge these days. The dining rooms, for all their cliches, are extremely comfortable and are lively without being too noisy. And the massive, 350-bottle wine list is filled with excellent picks — in particular, the California cabernets — priced from the high $30s to hundreds of dollars for some of the biggest names from Napa and Bordeaux. You may need a magnifying glass to read the list's microscopic print, but the restaurant's young staff are so well-prepared that their guidance is worth seeking out. During my visits, two of my servers seemed to know everything about the wines, from basic recommendations and the history of unfiltered wines to the subtleties among California's different wine regions. One server had the good instincts to call on another waiter when he couldn't answer a question. And the moment I veered from his advice I was disappointed, stubbornly opting for a 1997 Chateau Greysac ($46) that was still too young and rough. In fact, the service may be the most impressive thing about this restaurant. It isn't hard to memorize a spiel about such a basic menu. But such confidence and enthusiasm are refreshing in a city beset by a shortage of good staff, especially in steak houses, which are notorious for favoring regulars and corporate VIPs. Even the reservationists were a pleasure to speak with on the phone. The credit goes to managing partner Ed Doherty, who came with chef Steve Annabel from the Devon Seafood Grill and has developed into one of Philadelphia's best front-of-the-house managers. As he moves amiably from table to table greeting diners (and memorizing faces), he gives them the sense that they have a sincere advocate. The 5-year-old at Table 23 ordered a hot dog? Somebody is already running to Wawa to get it. Want something from the dinner menu at lunch? No problem. Much of Doherty's career was spent as a chef, so, not surprisingly, the food is top-notch. And as most local steak houses go, the meat entrees are fairly priced, around $30 or less. The restaurant has a dry-aging room on-site that turns out tender beef cuts with complex flavors that don't get too funky. The sirloin steak was outstanding, whether served plain or encrusted with just the right amount of cracked peppercorns. The 24-ounce porterhouse was infused with extra flavor from the bone. But my favorite cut by far was a Delmonico rib steak with flavor as rich as fine butter. The nonbeef chops were also superb, including an amazingly tender veal T-bone and a generous, meaty rack of well-trimmed lamb. My only problem with the meat entrees was the sauces, which were vaguely sweet and so flabby with butter that they became a nuisance. Meat-phobes also have plenty to choose from. Except for the lobster entree, which was too ordinary at $20 a pound, everything was delicious. The fish was cooked to perfection, the sushi-grade tuna seared ruby rare, and the mild, flaky swordfish still moist, though cooked well done. If you're craving lobster, head for the appetizers. The whole steamed one-pound chick, served cold with house-made mayo, is a great bargain at $14. Tiny lobster claws add panache to moist, lumpy crabcakes. The classic clam chowder is nicely cooked, with fresh clam flavor, firm cubes of potato, and a smoky undertone of bacon. Raw oysters are cold, firm and perfectly shucked. The calamari are tempura-fried and then sauteed with hot peppers in garlic butter, giving the crust an addictive, spicy tang. The desserts are fine, but the selection so standard — creme brulee, cheesecake, white chocolate mousse, fresh berries — that they're hardly worth mentioning, except for my twinge of disappointment at seeing mass-produced Haagen-Dazs on a fine-dining menu. When denizens of the steak circuit compare chophouses, the discussion inevitably comes down to the side dishes. Capital Grille's steamed asparagus resembles a raft of verdant stalks towing a boat of frothy hollandaise that I "do" recommend tipping. The side of mushrooms is a satisfying mix of oysters, portobellos and shiitake caps roasted in herbed garlic oil. And the creamed spinach, which improved considerably between my visits, is a lush, leafy puree enriched with a nutmeg-scented bechamel sauce. But the true test of a steak house is its potatoes. At the Capital Grille, they are hand-mashed into a creamy cloud tinged with garlic butter; roasted into crisp-skinned lyonnaise wedges sweetened with caramelized onions; or fried cottage-style and topped with a haystack of onions. Or baked, quite simply, as is, transforming a one-pound Idaho monster into an airy wonder, a heroic spud to crown a meal that shows how good meat and potatoes can be.